In a corner of a room sits a triangle of equipment, gazed at by a dozen curious onlookers. The inventor switches it on and a dozen baffled stares swivel to a patch of thin air in the center of the room. For there, apparently out of nothing, music has suddenly started to play. Thus Elwood Norris describes his demonstrations. He and his company, American Technology Corporation, of Poway, California, have filed patents for a new way to produce sound. The method, strange as it may seem, is to combine two ultrasonic sounds (sounds higher in pitch than those that humans can hear) into a single, audible one. 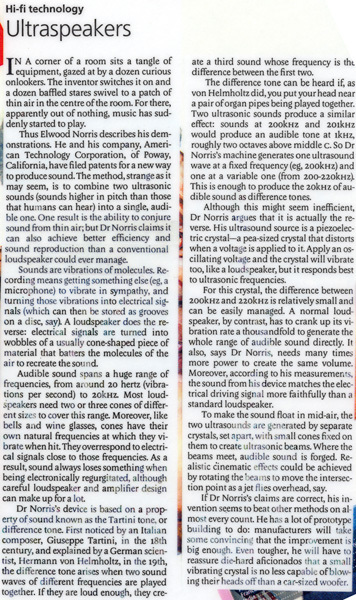 One result is the ability to conjure sound from thin air; but Dr. Norris claims it can also achieve better efficiency and sound reproduction than a conventional loudspeaker could ever manage. Sounds are vibrations of molecules. Recording means getting something else (eg., a microphone) to vibrate in sympathy, and turning those vibrations into electrical signals (which can then be stored as grooves on a disc, say). A loudspeaker does the reverse: electrical signals are turned into wobbles of a usually cone-shaped piece of material that batters the molecules of the air to recreate the sound. Audible sound spans a huge range of frequencies, from around 20 hertz (vibrations per second) to 20kHZ. Most loudspeakers need two or three cones of different sizes to cover this range. Moreover, like bells and wine glasses, cones have their own natural frequencies at which they vibrate when they hit. They overrespond to electrical signals close to those frequencies. As a result, sound always loses something when being electronically regurgitated, although careful loudspeaker and amplifier design can make up for a lot. Dr. Norris's device is based on a property of sound known as the Tartini tone, or difference tone. First noticed by an Italian composer, Guiseppe Tartini, in the 18th century, and explained by a German scientist, Hermann von Helholtz, in the 19th, the difference tone arises when two sound waves of different frequencies are played together. 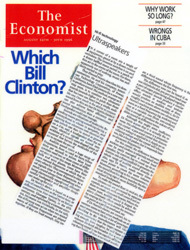 It they are loud enough, they create a third sound whose frequency is the difference between the first two. The difference tone can be heard if, as von Helmholtz did, you put your head near a pair of organ pipes being played together. Two ultrasonic sounds produce a similar effect: sounds at 200kHZ and 201kHZ would produce an audible tone at 1kHZ, roughly two octaves above middle c. So Dr. Norris's machine generates one ultrasound wave at a fixed frequency (eg, 200kHZ) and one at a variable one (from 200-220kHZ). This is enough to produce the 20kHZ of audible sound as difference tones. Although this might seem inefficient, Dr. Norris argues that it is actually the reverse. His ultrasound source is a piezoelectric crystal--a pea-sized crystal that distorts when a voltage is applied to it. Apply an oscillating voltage and the crystal will vibrate too, like a loudspeaker, but it responds best to ultrasonic frequencies. For this crystal, the difference between 200kHZ and 220kHZ is relatively small and can be easily managed. A normal loudspeaker, by contrast, has to crank up its vibration rate a thousandfold to generate the whole range of audible sound directly. It also, says Dr. Norris, needs many times more power to create the same volume. Moreover, according to his measurements, the sound from his device matches the electrical driving signal more faithfully than a standard loudspeaker. To make the sound float in mid-air, the two ultrasounds are generated by separate crystals, set apart, with small cones fixed on them to create ultrasonic beams. Where the beams meet, audible sound is forged. Realistic cinematic effects could be achieved by rotating the beams to move the intersection point as a jet flies overhead, say. If Dr. Norris's claims are correct, his invention seems to beat other methods on almost every count. He has a lot of prototype building to do: manufacturers will take some convincing that the improvement is big enough. Even tougher, he will have to reassure die-hard aficionados that a small vibrating crystal is no less capable of blowing their heads off than a car-sized woofer.